Water creates less stress on joints: Exercising in the water has a buoyancy effect which decreases pain and facilitates effective exercise. 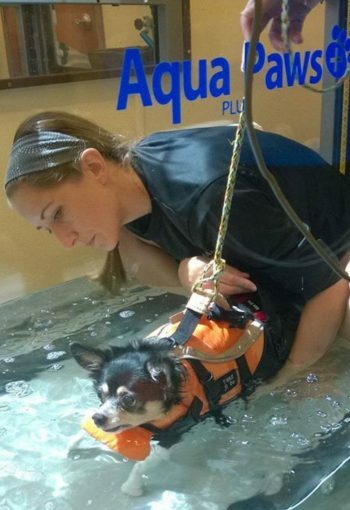 Hydrotherapy is especially beneficial for overweight animals or those with a joint injury. Water helps develop muscle mass and strength: Exercising against the resistance of water develops muscle mass and strength in an environment that produces less impact on sore joints. Animals may also use an exaggerated gait in water; the water aids in extending range of motion. Water aids in pain relief: Warm water has a soothing, compressive action that improves circulation and lymphatic drainage. This reduces swelling, improves joint health and increases mobility. Muscles relax, which is also soothing for dogs with arthritis, neuromuscular disorders and cancer. Water increases metabolism: Exercise in water burns 5 to 10 times as many calories as exercise on land, thus increasing cardiorespiratory endurance and aiding in weight loss. Water improves core strength: Swimming our dogs can challenge their balance and coordination and strengthens abdominal and back muscles. Neuromuscular re-education: The viscosity of water stimulates and increases sensory awareness. Many of our neurosurgery patients first regained movement of their hind legs while swimming in the pool or walking in the underwater treadmill. Can older dogs benefit from the underwater treadmill or swimming? Some of our most successful patients are aged dogs who discover a new lease on life through rehab. Aging pets need to keep moving to prevent decline. We stress pain relief, core fitness, and gentle exercise, often in the non-weight bearing environment of water. Arthritic dogs in particular stand to gain mobility and increased quality of life with an aquatic treatment plan. Is swimming a part of every dog's therapy plan? Each pet has a customized therapy plan best suited to their needs. While swimming can be an excellent exercise, it is not for every pet. If you are interested in this modality, it’s best to speak with the doctor at your exam. Why does my dog need to wear a life jacket to swim? 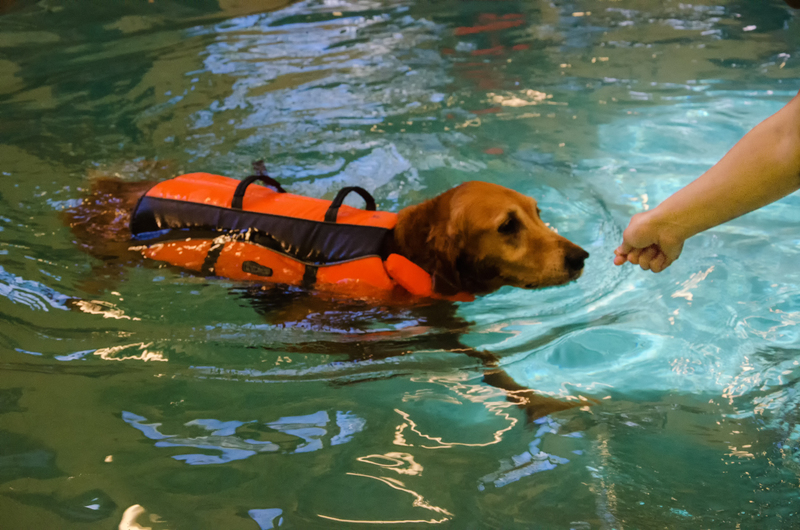 Your dog may swim at home without a life jacket, but we always start our patients in life jackets at the Animal Therapy Center. This allows us to have more control of your pet in the pool should they become nervous or have trouble. We have also found that some dogs are more comfortable wearing a life jacket as they feel more secure. Our therapists will assess and determine if your pet will require a life jacket long term of if they can remove the jacket later in your pet’s therapy plan. At the Animal Therapy Center, we can accommodate patients of all sizes! Our aquatic area features two underwater treadmills as well as indoor heated pool! Check out our Live Webcams to see us in action to see our set up or to watch the dogs have fun!